One more in this series. Thanks for working through them with me. 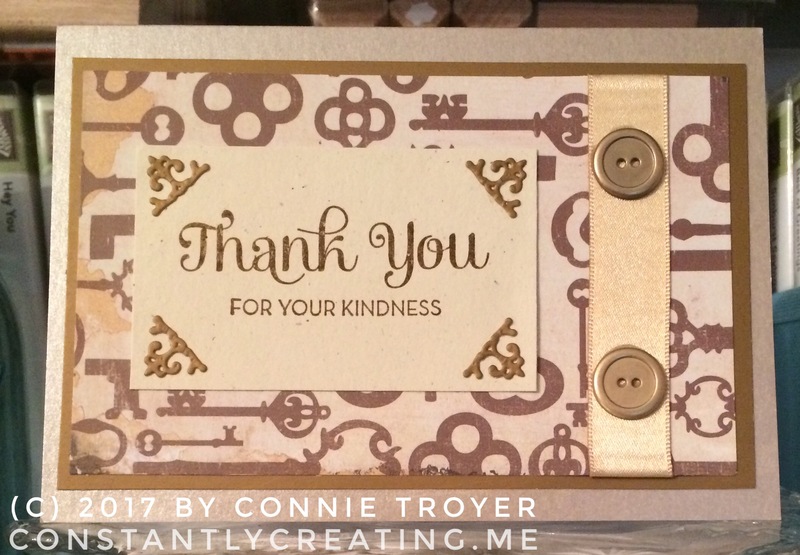 I used “Brushed Gold” (retired) cardstock from Stampin’ Up as a base for this one. I have a partial pack of 8.5 x 11 cardstock and cut one sheet down to an A2 size before scoring it in half with my scoring board (wonderful invention, and so much easier than trying to fold it in half without creasing it where you don’t want to, which was the way I used to do it). I’m not really a “gold” person, but I do like this cardstock and wish it was still current. It has a beautiful shimmer in the light and isn’t too gold for me. When I remember to do it, I wait until I have most of my pieces ready or a solid idea of what I want to do before I start gluing layers together, so I can do things like wrapping this ribbon around part of the paper. Wrapping it is better than cutting it off, which will cause it to fray (and then get too short despite your initial measuring). Trust me on this. 🙂 I mean, yes, you can cut it with pinking shears, but you won’t always want that particular look. And you can use Fray-Check or another glue, as I used to, but then the ribbon will darken or even harden where the liquid was applied. And that’s not very pretty. So for me, wrapping works…when I plan ahead or stop to think about how to put everything together. The ribbon in this particular case is a retired 5/8″ Gold Satin ribbon from Stampin’ Up, and the flattish buttons are SU Gold Metallic Buttons (also retired – notice a theme yet?). I thought about using another fancy die for the sentiment block, but time was growing short and I wondered whether the curves of the die might conflict with the shapes of the keys. When I found this scrap of Naturals Ivory (Stampin’ Up, retired) that was already cut down, that settled the debate. (This is one reason why I keep scraps with their pads.) This cardstock has little random flecks of color in it in keeping with that “natural” look. 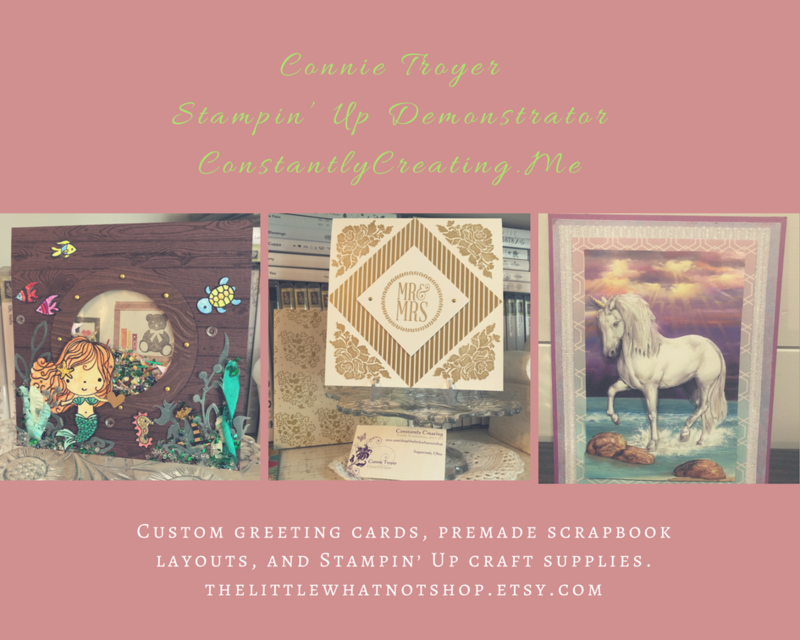 I decided not to use the gold embossing powder on this card. It was late, T was sleeping, and my heat gun, since it’s almost twenty years old, is not the quietest. I hear the newer versions are much better with that – but mine works just fine, so I’m not going to invest in another one until it dies. Probably. So for this sentiment I just used my Soft Suede ink pad (Stampin’ Up, current). Stamps are also SU and from the “One Big Meaning” (current) and “So Very Much” (SAB, retired) sets. So that’s it for this card and my five-note thank-you set. Which one was your favorite? This one might be mine, as it was both easy yet somewhat detailed. Thanks for reading! Feel free to “follow” me for more card ideas and tips in future posts.